Getting tons of free PR for your product, service, or business - once difficult, now easy! Why pay a big city PR firm $30,000 to $120,000 or more when you can make and keep far more than that with a simple "do-it-yourself" PR campaign? If you were guaranteed $10,000 or more in new leads and sales after listening to a simple program, would you do it? Bob Bly's "Do-It-Yourself Public Relations" guarantees you'll earn $10,000 or more when you implement his simple program...or your money back. And he's serious about that guarantee. That's more than 100 times the cost of the program. It costs less than $100 to get started. And, yes, Bob and I both guarantee you can generate at least $10,000 - more than 100 times the cost of his program -- in new leads, customers, and sales ... or your money back! Over the last decade I made regular use of these PR techniques and they generated FAR more than $10,000. Free PR generated at least a few hundred thousand dollars in business in all those years. Not a bad return on investment, no matter how you look at it! 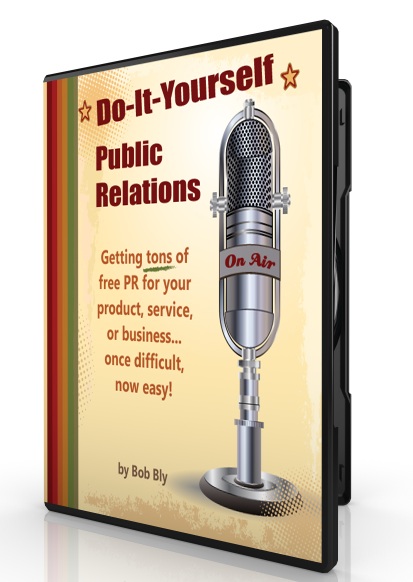 Public Relations (PR) is one of the most effective yet most neglected small business tools available to you. And you don't have to spend thousands of dollars getting ripped off by an ineffective PR firm. You can easily do it yourself. Click the button below to discover how easy it is to get tons of free PR for you and your business.